This page briefly covers the history of the Catholic Church in the territory that is now the Diocese of St. Joseph in Irkutsk. The appearance of Catholics in Eastern Siberia and the Russian Far East is, above all, connected with the Russian policy of political and penal banishment of the 17th-19th centuries. At the beginning of the 19th century, the first Catholic missionary priests arrived. From 1806 to 1812 a mission of the Dominican Fathers was realized in Irkutsk. In 1812, priests of the Jesuit order began to work there, and in 1820 the Bernardine Franciscans replaced them. Under the direction of these Bernardine Fathers, the first Catholic church in the entire territory was built in Irkutsk in 1825, called the Church of the Assumption of the Most Holy Mother of God. 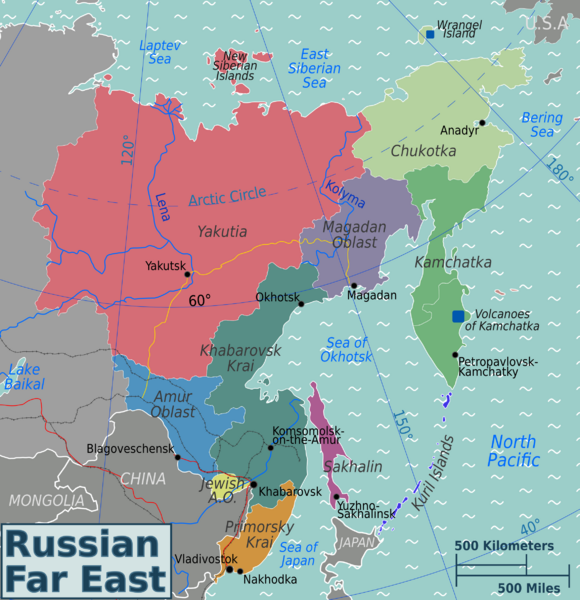 Map showing the different sections of the Russian Far East. Vladivostok is near the bottom of the map. Original work by Peter Fitzgerald for WikiTravel. In 1820, the official, organizational structure of the Church in the territory that would later become the present day diocese of Saint Joseph in Irkutsk began with the establishment of the Irkutsk parish. At the time, this parish was the largest in the world in terms of geographic extension, taking in the immense territory of the province of Irkutsk and the entire region of Yakutia in the northeastern central part of Eurasia. Up to the middle of the 19th century, the territory of eastern Siberia included only three parishes: the one in Irkutsk, one in Krasnoyarsk (formed in 1836), and another in Nerchinsk (formed in 1842). There were no known formally established parishes in the Russian Far East. At that time, there were about 1,350 Catholics in the Irkutsk parish, nearly 1,500 in the Krasnoyarsk parish, and around 1,000 in the Nerchinsk parish. In 1866 another parish was begun in Nikolaevsk-na-Amure, a military headquarters, which was transferred to Vladivostok in 1890. All these parishes belonged to the Archdiocese of Mogilev, a city 500 miles southwest of Moscow. During the entire 19th century, the main reason for the appearance of Catholics in Siberia and the Russian Far East was prison labor and banishment, as it had been in the 17th and 18th centuries. After thousands of participants in the Polish Uprising of 1830 were sentenced to hard labor and banished to Siberia, Poles became the largest ethnic group among Catholics in the Asian part of Russia (i.e. all lands lying between the Ural Mountains and the Pacific Ocean). 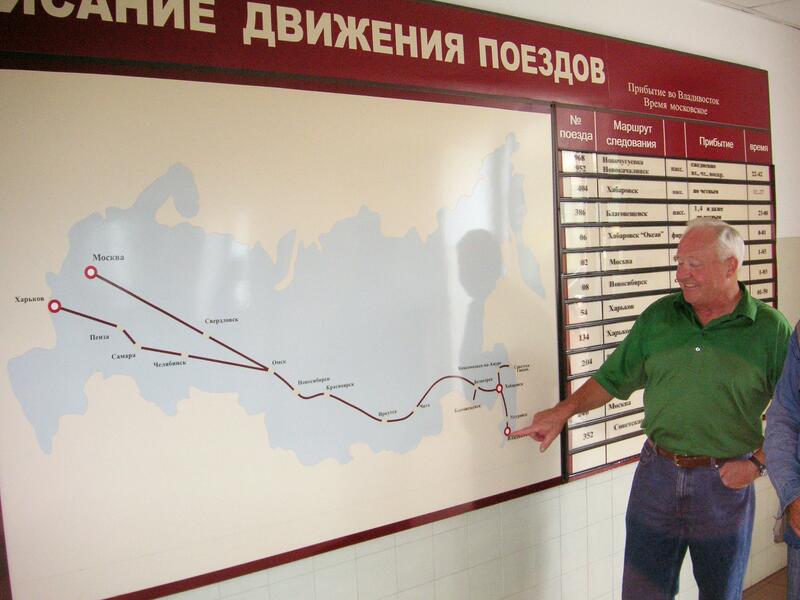 A map showing the Trans-Siberian railroad, the longest railroad in the world. 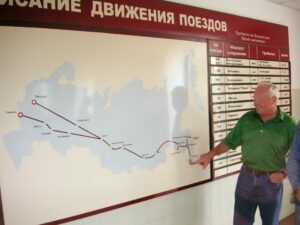 The gentleman is pointing to Vladivostok, the eastern terminus of the railroad. At the end of the 19th and the beginning of the 20th century, the construction of the Trans-Siberian railroad caused a large influx of Catholics, creating many workplaces. Another major cause of Catholic immigration was the resettlement of peasant farmers from the western regions of the Russian empire during the Stolipin agrarian reform. (Stolipin was a Russian Minister of Agriculture.) Between 1894 and 1911 the number of Catholics in the province of Irkutsk increased almost five times and reached 30,000 people, while in the province of the Yenisey, the number rose from 5,000 in 1898 to 15,000 in 1912. At this same time there appeared many new Catholic churches and chapels: in Irkutsk, Vladivostok, Khabarovsk, Alexandrovsk on Sakhalin Island, and other population centers. At this time in the Soviet Union, however, a massive attack on religion began. Priests were murdered, and church buildings were closed and destroyed. At the end of the 1920s, the church in Krasnoyarsk was closed. In the early 1930s, those in Chita, Vladivostok, Khabarovsk, and Alexandrovsk-Sakhalinsky were closed. And in 1938 the churches in Irkutsk were also closed. By the end of the 1930s, practically the entire structure of the Catholic Church in Russia had been destroyed. As a result of the Stalinist repression, thousands of exiles from western Ukraine, Belarus, and the Baltic countries found themselves in Siberia and the Russian Far East in the 1930s and 1940s. Many of them were Catholics. However, because of the conditions of repression, they were required to hide this fact and no parishes could be revived or established. The reestablishment of Catholic Church structures came about only at the beginning of the 1990s. On April 13, 1991, two apostolic administrations were organized on Russian soil: one for the European part of Russia (west of the Ural Mountains) and one for the Asian part (east of the Urals). Bishop Joseph Werth was named the Apostolic Administrator of the Asian Part of Russia. All of the Catholic communities in this immense territory came under his jurisdiction. The Church of the Nativity of Jesus, the Catholic parish in Magadan. Photographed by Fr. Michael Shields. 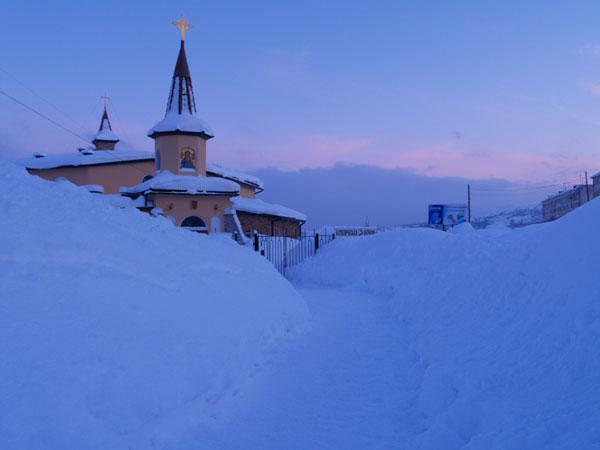 The parish of the Nativity of Jesus in the city of Magadan became the first parish officially registered by the Russian government in what was then called the Apostolic Administration of Eastern Siberia. It received its legal registration on January 3, 1991. In large part this was due to the activity of Archbishop Francis T. Hurley, D.D., of Anchorage, Alaska. Soon afterwards, parishes in other large cities were established: Krasnoyarsk (May 15, 1991); Irkutsk (September 14, 1991); Vladivostok (January 4, 1992); South-Sakhalin City (February 25, 1993); Aldan (July 1992); and Khabarovsk (October 1, 1993). From these main centers, priests traveled to outlying towns and villages to organize parish life in other Catholic communities. With pastoral activity growing, the bishops of Russia together with the papal nuncio to Russia appealed to the Holy See to appoint auxiliary bishops for both apostolic administrations. As a result, during the summer of 1998, the Church in Russia received Bishop Klemens Pickel for the city of Saratov in European Russia, and Bishop Jerzy Majzur, S.V.D., for the city of Irkutsk in Asian Russia. After one year, Bishop Mazur became the head of the new Apostolic Administration for the Latin rite Catholics of Eastern Siberia, established on May 18, 1999, and centered in the city of Irkutsk. Here construction of the Cathedral of the Immaculate Heart of Mary was begun in June of 1999. Its solemn consecration was on September 8, 2000. By a November 10, 2000 decree of His Holiness Pope John Paul II, the head of the Apostolic Administration of Eastern Siberia, Bishop Jerzy Mazur, was also named the Apostolic Administrator of the former Prefecture of Karafuto. In this area are located the territories of South Sakhalin Island and the Kuril Islands. Until this decree, the former prefecture, established in 1938, belonged to the jurisdiction of the bishop of Sapporo (Japan). In 2002, Pope John Paul II established the diocese of St. Joseph in Irkutsk to serve eastern Siberia and the Russian Far East. 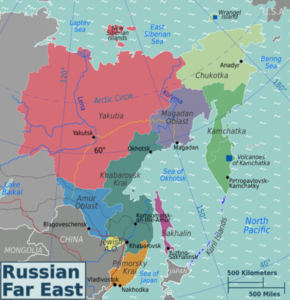 Since then, new parishes have been formed in Trans-Baikal (Chita, Ulan Ude, Angarsk, Bratsk, Usole-Siberskoe, Achinsk, Eniseysk, Kansk, Lesosibirsk, Norilsk, Abakan, Yakutsk, and others); and in the Far East (Blagoveshensk, Arsenyev, Ussurisk, Komsomolsk-na-Amure, Nikolaevsk-na-Amure, Lesozavodsk, Petropavlosk Kamchatsky, Ola, and others). Members of various religious congregations and orders of men and women now labor in the diocese of St. Joseph. In 1991 after preliminary talks with Bishop Joseph Werth, the congregation of Claretian Missionaries sent two of its members from Poland to work in Krasnoyarsk. In September 1992 a monastery of Claretian missionaries was founded there, and in 1997 another community of Claretians was established in the city of Achinsk. 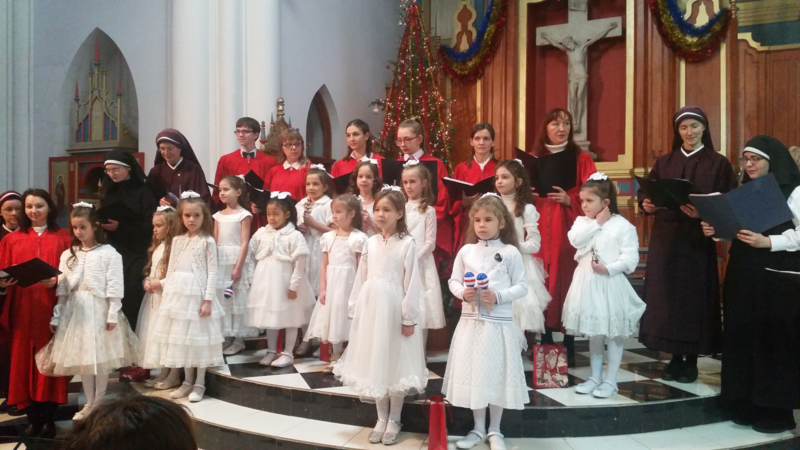 After the founding of the Irkutsk parish in September 1991 with the appointment of a member of the Society of the Divine Savior (Salvatorians) as pastor, the Polish Salvatorians began working in Irkutsk. In 1992, sisters of the Congregation of Adoratrices of the Blood of Christ arrived in Krasnoyarsk, as did sisters of the Order of Sisters of Charity of St. Charles Borromeo. Because of the growth in number of local vocations, the General Council of the Order of Sisters of Charity of St. Charles Borromeo decided to open a Russian House of Formation. In 1999, with the blessing of Bishop Jerzy Mazur, such a house was opened in Irkutsk. In January 1992, members of the Congregation of Salesians of St. John Bosco arrived in Aldan. They went there to decide whether or not to have a permanent presence of priests of their order in that region. In July 1992 three men of the Salesian religious arrived there for service. In November 1997 two priests of the Foreign Mission Society of America (Maryknoll) (U.S.A.) arrived in Khabarovsk. One of them went to work on Sakhalin Island. The other stayed in Khabarovsky Krai. Not long afterward, three more members of their society joined them. In addition, the religious sisters of the Japanese order of Sisters of the Visitation of the Blessed Virgin Mary began working in the parish communities of Khabarovsk and Khabarovsky Krai. From 1999, at the initiative of Bishop Jerzy Mazur, SVD, and the Apostolic Nuncio in Moscow, Archbishop John Bukovsky, SVD, members of the Society of the Divine Word have been present. The Divine Word community was established in Blagoveschensk in 1999. During the same year, Fr. Aleksander Pietrzyk, SAC, a Polish Pallotine priest, started to work in Irkutsk. 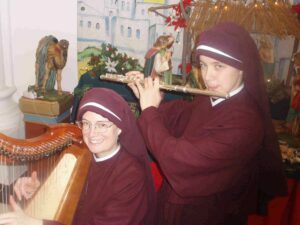 Sr. Maria Stella and Sr. Catherine Marie, two members of the order of Sisters in Jesus the Lord, who are now living in the Russian Far East. In August 1998 a community of the Sisters of Charity of St. Ann was founded in Vladivostok, with the arrival of four sisters from Spain. The Sisters of the Congregation of St. Paul of Chartres (Paulist Sisters) from Korea also began working in Vladivostok. Since 2000 there have arrived the Sisters Servants of the Holy Spirit from Poland; sisters of the Order of St. Dominic; Sisters Servants of the Immaculate Conception of Mary; members of the Society of Our Lady of the Most Holy Trinity from the U.S.; Maryknoll fathers from the U.S.; Carmelite friars and nuns from Poland:, and diocesan priests from Poland and Slovakia, India and Korea. In 2013, the Sisters in Jesus the Lord came to the Russian Far East to serve on Russian Island as well as in Vladivostok and the surrounding area. The Sisters were from a new order in the U.S., and had visited southeastern Russia several times before establishing a permanent home.